Historic Printer's Proof Vignette from Blockbuster Entertainment Corporation dated 1989. 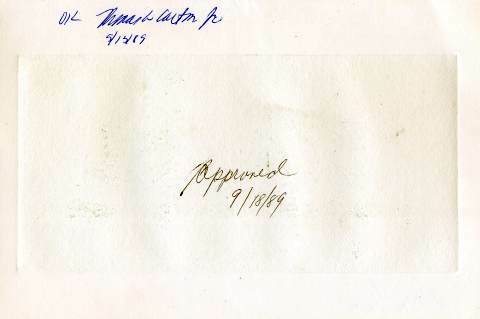 This historic document came from the archives of the American Banknote Company and shows the final approved vignette that was used on their public stock certificate. This item is Unique and RARE and only one of these exists. The first Blockbuster store opened in Dallas, Texas on October 26, 1985 at the corner of Skillman and Northwest Highway. The founder of the company was David Cook, who grew the business and brought it public. The innovation was derived from Cook's experience with managing huge databases. After the first few stores opened, he built a $6 million warehouse in Garland, TX that could pull and package multiple stores in a day. Key to the early success of Blockbuster, was their ability to customize a store to its neighborhood, loading it up with films geared specifically to demographic profiles in addition to the popular new releases, and a sizeable collection of catalog titles. The logo was created by Lee Dean, working for the now defunct Rominger Advertising agency. Scott Beck, a young businessman in Dallas, approached John Melk, prior executive with Waste Management, about buying a franchise. Melk brought the idea to his friend and business associate, Wayne Huizenga, who agreed to buy the company after overcoming initial concerns about the video industry. Huizenga and Melk used similar techniques in growing Waste Management, and soon, they were opening one store every seventeen hours. They also bought every Blockbuster franchise they could get their hands on (removing pornographic movies). The company became a multi-billion dollar company and was sold to Viacom for a price of $8.4 billion. The Blockbuster Block Party concept was test-marketed in Albuquerque, New Mexico and Indianapolis, Indiana; Block Party was an "entertainment complex" aimed at adults, containing eight themed areas housing a restaurant, games, laser tag arena and motion simulator rides and was housed in a windowless building the size of a city block. During the 1990s Blockbuster bought out their major UK rival Ritz Video and changed the name of all the stores to their own, which made them the number one video rental store in the country by a wide margin. In 1992, Blockbuster acquired the Sound Warehouse and Music Plus music retail chains and created Blockbuster Music. In August 1998, Viacom sold the Blockbuster Music chain to Wherehouse Entertainment, who was subsequently purchased by Trans World Entertainment in 2003. In 1993 Blockbuster proposed a merger with Viacom, however, after both companies' stocks tumbled in 1994, Viacom eventually purchased Blockbuster. 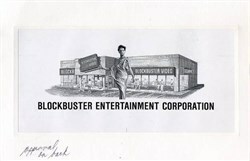 In 1996, the Blockbuster Entertainment Corporation was renamed Blockbuster, Inc. and the retail stores, then called Blockbuster Video, were renamed Blockbuster. Older stores have not changed. During that year Blockbuster, which was then headquartered in Fort Lauderdale, Florida, began studying the idea of moving its headquarters into the Renaissance Tower in Downtown Dallas. In November 1996 Blockbuster confirmed that it was moving into the Renaissance Tower. Most of the workers at the Florida headquarters did not want to relocate, so Blockbuster planned to hire around 500 to 600 new employees for its Dallas headquarters. The company had offered various relocation packages to all of its Fort Lauderdale employees. Near Bankruptcy On February 10, 2010, Blockbuster announced that it would cease all its operations in Portugal, closing down in the process 17 outlets and leaving over 100 workers unemployed. Blockbuster representatives in Portugal blamed internet piracy and the lack of government response to it as the key factors to the company's bankruptcy in the country. By March 2010, Blockbuster was in talks of selling its European operations altogether, but would not disclose the details. On March 1, 2010, Blockbuster began "Extended Viewing Fees" for rentals not returned by their due date in the United States, having already used this procedure in other countries such as the UK for many years. An "Additional Daily Rate" is charged for each day a member chooses to keep the rental beyond the rental terms. On March 12, 2010, PricewaterhouseCoopers, Blockbuster's independent registered public accounting firm, issued its audit opinion disclosing substantial doubt about Blockbuster's ability to continue as a going concern. This report was included in Blockbusters's 10-K SEC filing. On March 17, 2010, Blockbuster issued a bankruptcy warning after continued drops in revenue threatened its ability to service its nearly 1 billion dollar debt load. By April 1, 2010, Carl Icahn, a significant minority shareholder since 2004, had resigned from Blockbuster's board of directors and sold nearly all his remaining Blockbuster stock. In May 2010, dissident shareholder, Gregory S. Meyer, in an effort to be elected to Blockbuster's board of directors, engaged in a proxy battle with Blockbuster's board alleging that the board has been responsible for significant destruction of value to shareholders. Mr. Meyer was elected to the board at Blockbuster's shareholder meeting in Dallas, Texas on June 24, 2010. On 1 July 2010 the company was delisted from the New York Stock Exchange after its shareholders failed to pass a "reverse stock split" plan aimed at heading off involuntary delisting due to the share price trading well below $1 per share. The stock now trades on the over-the-counter bulletin board (OTCBB). In addition, Blockbuster was unable to make a $42.4 million interest payment to bondholders and was given until August 13, 2010 to pay off the debt. The company hired Jeff Stegenga to be its chief restructuring officer (CRO) in an effort to satisfy bondholder demands and recapitalize the company. After failing to pay on August 13, bondholders gave Blockbuster until September 30, 2010. On August 26, 2010, news media reported that Blockbuster was planning on filing a pre-packaged Chapter 11 bankruptcy in mid-September. In light of this news, the company's chief financial officer (CFO), Tom Casey, resigned on September 11. He was replaced by Dennis McGill, formerly CFO of Kleen Systems, Inc.